Campers will experience various stations, specializing in fundamental skills of football. Individual groups will be small to assure that each camper gets maximum instruction from the top football coaches in the Tennessee area. Individual groups will be small to ensure that each camper gets maximum instruction. 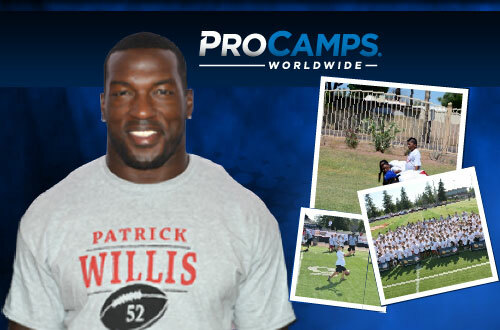 Campers will participate in games, stations, and skill contests during the Patrick Willis Football ProCamp. Each camper will be placed on a team according to his or her age. Willis will give talks highlighting the finer points of the game of football and beyond. Parents and guests will be able to listen to camp guests in designated areas at each location. Patrick Willis is a 6-time Pro Bowl linebacker who plays for the San Francisco 49ers. He is considered one of the most dominating defensive players in the NFL. If you would like to book football speakers or athletes like Patrick Willis for a speaking engagement, autograph signing, product endorsement, fundraiser or special event, contact Patrick Willis’s booking agent for appearance & speaker fees at Sports Speakers 360. For booking agent and appearance fee information on how to hire San Francisco 49ers players for appearances, call 1.855.303.5450.